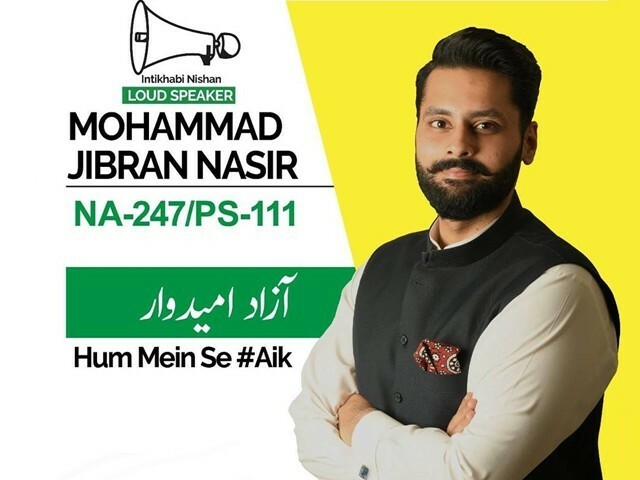 Over the course of last two weeks, Mohammad Jibran Nasir, an independent politician, has faced a thorough degree of inquiry regarding his beliefs about Ahmadis in Pakistan, and the legitimacy of them calling themselves “Muslim”. For his refusal to curse them – a condition set by a corner meeting attendee at the promise of a vote – he has been accused, publicly, of being a blasphemer. Being an army brat, I am largely reluctant to voice my opinion on matters that are rather political. Our conditioning, generally, is such that we maintain consistency in following disciplined lines of action – ensuring that we rarely, if ever, stray from an apolitical lifestyle. However, in all of us, there lies one core belief, and that is the belief in the value of life, every human’s right to self-advocate and right to their beliefs. Thus, the defamation campaign against Jibran has not come as a shock, but a halting reality that continues to haunt our already weakened social and national fibre. Thus, I am forced to speak today for Pakistan’s next hero – one who stands for the rights of the weak and oppressed. A Pakistani who is pure of politically manipulative thought. A potential leader who could finally change the way this country functions. I would never have publicly supported a politician unless I understood and agreed with their frame of thought. 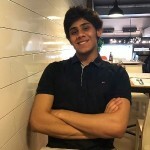 However, having clearly seen Jibran’s courage and resolve in the face of social manipulation, I began exploring his political ideology which has come, finally, as a pleasant surprise. His manifesto alone speak volumes about the service-oriented leader that he strives to become. Succinctly, Jibran promises a Pakistan based on a very Muhammad Ali Jinnah-esque ideology – his manifesto quoting the famous “you are free to go to your temples…” speech highlights his dedication to ensure peace in the society. The manifesto also elaborates on his plans to control VIP culture, whilst providing basic functional necessities such as employment opportunities, access to justice and to drinkable water in order to promote economic prosperity. What haunts me, nonetheless, is the hate campaign that has recently begun against this young, strong leader. In a very recent press conference, Jibran stated that extremist outfits were out to disrupt his campaign as his service-based activism, void of religious or braadry (caste) support, posed a threat to the campaigns of factions that gained most of their votes by cashing out religious, socio-cultural or ethnic vote banks. In the last few weeks, a local mosque cleric within his constituency has given orders to “stone Jibran if he ever enters the area again” as it is “halal and jaaiz (permissible)”. Similarly, questions about his lacking hatred for Ahmadis have repeatedly been brought to his corner meetings in attempts to sway away votes on a socio-religio-political basis, and heckle the aspiring candidate. He has maintained strongly that he intends to pursue a campaign that focuses on public service, irrespective of religion and religious beliefs. He hopes to serve the community and has responded to such heckles with impeccable maturity and calm. Last night, during his campaign in Bizerta lines, it is being reported that Jibran and his team were attacked by a certain right-wing party’s workers and supporters, allegedly belonging to Tehreek-e-Labbaik Pakistan (TLP). 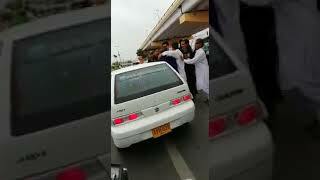 Their car was smashed and his workers were beaten up. While this mob kept shouting chants and threats, Jibran responded with flying kisses. He and his team refused to back down from the campaign and braved through the lanes of Bizerta lines. In response, Jibran’s media address was noteworthy where he elaborated the need for education for the youth involved in such terror-driven activities, and how they require love and affection to grow into individuals who come find the right path, away from that of being astray. In his words, they need aik jaado ki jhappi aur pyar bhari pappi (a magical hug and a love-filled kiss)! Just received this: Jibran Nasir independent candidate from #NA247 & #PS111 & his workers attacked by #TLYP in Bizerta lines car smashed. His reply is testament to his high level of maturity, political sensitivity and strong sense of social responsibility. He is, at least in these General Elections, one of the very few politicians, if not the only one, to stand for the rights of minorities such as Christians, Ahmadis and Hindus. However, regardless of his attempts to stand firm against the inaction of this country to protect such people, the campaign against him depicts the real state of Pakistan. Instead of supporting someone willing to fight social divide and stratification based on religious boundaries, a large opposition has developed solely to condemn Jibran’s entire campaign on the basis of his attempts to do so. Whilst this is not shocking in light of Pakistan’s history – it is still very, very disturbing. Although there is a plethora of support for him on social media, there are also people of the like who will simply hate him for his support of a minority – exposing Pakistan’s deep-rooted fundamentalist sectarianism. As visible in the image above, Pakistan is a long way from overcoming religious intolerance at a basic level. Compared to leading parties like Pakistan Tehreek-e-Insaf (PTI) – whose leaders are afraid of publicly supporting minorities – Jibran poses a saint-like humanist figure. Recently, PTI leadership claimed a poster to be fabricated (and developed by opposing parties to hurt their vote bank) as it suggested that the party would protect the rights of minorities like Ahmadis, Ismailis, Hindus, and support them. The fact that a new party, which previously amassed followers in large numbers for its liberal standing, is now publicly denying support to minorities is proof of the concept that in Pakistan, politics of hatred strives fiercer than that of harmony. This is NOT @PTIofficial graphic ! It is made by the enemies of the state who want to create chaos & mistrust amongst Pakistani’s! Leading his election campaign with the symbol of a loud speaker – befittingly so, as metaphorically represented in his loud speech against hatred – Jibran is Pakistan’s ideal candidate. It is a shame that he is being threatened, attacked and smothered by blasphemy allegations in attempts to dilute his vote bank. However, regardless of how many people stamp on the loud speaker come July 25th, Jibran truly is an inspiring figure, a genuine ray of hope in Pakistan’s deeply disturbing political, social and religious world. He is the change we need in a country where progressive parties like PTI use convicted killers and religious hatred to gain votes and convicted embezzlers gain sympathy votes for being imprisoned. Where men like Bilawal Bhutto Zardari are criticised for being too feminine, while his sister finds trouble in gaining a party ticket from her mother’s own party due to her being a woman, and corrupt tehreeks upon tehreeks lock down cities to promote tyrannical fear and hatred. May Pakistan live long, prosper, and find many more young men like Jibran to lead it. After all, he is hum mein se #Aik (one of us). I needed to know where exactly I had to go for voting……I asked the PTI and they were clueless…..then I asked a small PPP office and they offered me a cup of tea…..then I decided to go to Jibrans office. There three bright very young boys and girls whipped out their cellphones and presto I got what I was looking for. Ahmad, they convinced me of nothing. What I tried to show was that the three young persons were responsive, committed and explained to me exactly where I had to go to cast my vote …. something none of the others did.